A traditional Haggadah portraying the age-old Passover story through modern-day images of deliverance and social responsibility in action. The Exodus story that we retell each year in the Passover Haggadah took place in Biblical times, but its lessons – of rescue, relief and renewal – echo throughout history. This new Haggadah has a dual role. It includes the full traditional text, from Kiddush at the beginning of the seder to Chad Gadya at the end. In that sense, it retells the Exodus story the way it has been told for generations. But this Haggadah adds another dimension: It shows how the lessons of the Exodus story have been practiced with love and compassion in the modern era. In Every Generation: The JDC Haggadah highlights the work of the American Jewish Joint Distribution Committee, which, since it was founded in 1914, has been the premier organization reaching out to Jews in distress around the world. 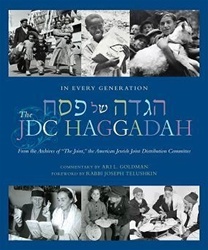 For the making of this Haggadah, JDC opened its vast archives of photographs, letters and documents, many of them never before made public. This Haggadah is rich in pictures of the rescue and relief of Jews in times of crisis – from pre-state Israel to post-Shoah Europe to Soviet Russia to the deserts of Ethiopia. It reminds us how the JDC helped liberate Jews in distress and provided for both their physical and spiritual needs. Some of the most moving images are of Jews who themselves narrowly escaped tragedy marking the Passover seder with the potent holiday symbols of matzah and wine. The connections between the Exodus story and these modern-day rescues are made in the inspiring Foreword by Rabbi Joseph Telushkin and the insightful Commentary by Professor Ari L. Goldman. Historical anecdotes inserted at appropriate points in the text feature firsthand accounts by both rescuers and those rescued. Skillfully edited by Linda Levi, Director of Global Archives for the American Jewish Joint Distribution Committee (JDC ), and JDC Consultant, Ilana Stern Kabak, what emerges is a vivid and moving account of the Exodus that reaches back through the ages and reminds us why the Passover story is a story for all times. Working on The JDC Haggadah has been a labor of love for two longtime friends, Professor Ari L. Goldman and Rabbi Joseph Telushkin. Each is prominent in his own field – Professor Goldman as a leading journalist and Rabbi Telushkin as a teacher of Judaism through such best-selling books as Jewish Literacy. Both are distinguished authors and soughtafter lecturers. For several years their families joined forces for Passover seders. Those seders were marked by lively discussions, dramatic readings and spirited singing, all of which served to make the ancient text come alive in the modern world. In addition to his book Jewish Literacy, Rabbi Telushkin is the author of A Code of Jewish Ethics, Volume 1 and Volume 2; Words That Hurt, Words That Heal; Biblical Literacy and four novels. He lives in New York City with his wife, D’vorah Telushkin, and their four children. Professor Goldman spent 20 years as a reporter for The New York Times before joining the faculty of Columbia University’s Graduate School of Journalism. He is the author of The Search for God at Harvard, Being Jewish and Living a Year of Kaddish. He lives in New York City with his wife, Shira Dicker, and their three children.